Ballymena United made it through to their second County Antrim Shield final in three years with a convincing 3-0 win over Ards. First half goals from Stephen McCullough and Conor McCloskey was just rewards for the Sky Blues’ dominance. The second half was a cagier affair, before Cathair Friel’s late strike sealed a meeting with Crusaders in the final. The Sky Blues almost broke the deadlock inside the first minute as Johnny McMurray exchanged passes with his strike partner Cathair Friel and raced in on goal. The front man delayed his shot though and Sam Johnston stood up well to block the shot. They did not have long to wait for the opening goal though as Steven McCullough curled home a superb free kick after Joe McKinney had been fouled by Gareth Tommons. The visitors almost drew level on ten minutes as former Sky Blue defender Johnny Taylor lost his marker from David McAllister’s corner, but his header was cleared off the line by a combination of Ross Glendinning and Fra McCaffrey. That clearance proved vital as inside three minutes the home side had doubled their advantage. A swift break out from defence saw Ards carved open. McMurray slipped the ball inside for McCaffrey, who in turn fed Friel. His shot squirmed past Johnston but Conor McCloskey was on hand to slide the ball into the empty net. It was a double whammy for Colin Nixon’s side who also lost Johnny Frazer in the build up to what looked like a serious injury. Ballymena went close to adding a third ten minutes before the break, and it came from another set piece. This time McCloskey tried his luck and he was only denied by a fantastic finger tip save by Johnston on to the cross bar. The ball was bouncing around the Ards penalty area with McMurray failing to slot home at the back post. Callum Byers breathed a sigh of relief on 37 minutes as his attempted clearing header nearly dropped into his own net. Ballymena spurned another great opportunity to make it 3-0 right on half time. They were awarded a rather soft penalty after a coming together between Taylor and McMurray, up stepped Tony Kane but his spot kick was well saved by Johnston. The Sky Blues picked up in the second half where they had left off in the first, and inside the first three minutes they had carved out two good opportunities. First Friel was denied by Johnston from close range, before McMurray’s follow up was blocked by Glendinning on the line. Ards went close to reducing the deficit on 53 minutes but Michael McLellan’s surling effort was palmed away by Glendinning. 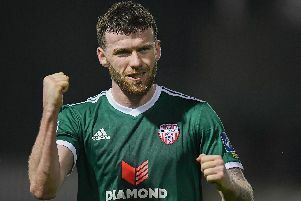 Friel and McMurry combined again on 74 minutes with the latter digging out a cross to the back, but his strike partner headed over. Right at the death McMurray crashed a fierce drive off the cross bar with Johnston beaten all ends up, before Friel showed great composure to slot home the third from close range. Ballymena United: Glendinning, Kane, Friars (Owens 30), Friel, McCloskey (Faulkner 75), Balmer, Ervin, McCullough, McCaffrey, McKinney, McMurray (Shevlin 88). Ards: Johnston, Glendinning, Taylor, Byers, Ruddy, Frazer (McMillan 15), Hanley (Cherry 65), Tommons, McAllister, McLellan, Mitchell (McComb 75).